(February 18, 2015 – Toronto, ON) Once upon a time on the outskirts of Toronto, Canada created the first spy school in the free world and, pictured above, it was called Camp X. Sir William Stephenson, the man James Bond was based on, was the head of Camp X. Advertising giant David Ogilvy mastered the power of propaganda at Camp X before becoming one of the most celebrated advertising giants of Madison Avenue. The camp opened on December 6, 1941, a day before the U.S. was forced into the war by the Pearl Harbour bombings. 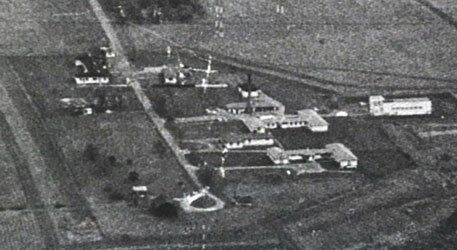 It went on to become not just an espionage boot camp for Britain, the United States, and Canada, but also as an international intelligence hub vital to winning the war. 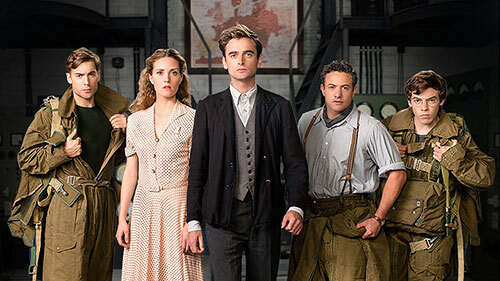 Tonight, inspired by remarkable true events, CBC turns back the clock for X Company, a new drama series set in the thrilling and dangerous world of WWII espionage and covert operations. X Company comes with some very solid credentials. The creators of Flashpoint and the producers of Orphan Black joined forces to produce this new period drama. Working with an international cast, X Company follows the stories of five highly skilled young recruits torn from their ordinary lives to become highly skilled agents at an ultra-secret training facility, Camp X. In the series premiere tonight, the head of Camp X, Duncan Sinclair (Hugh Dillon), pulls out all the stops to convince his British counterpart that Alfred Graves (Jack Laskey), a fragile young man with a perfect memory, would make a good Allied agent. Meanwhile Sinclair’s first team is already behind enemy lines working to thwart a German plot to slaughter an entire village. Shot on location in Hungary last summer, the series highlights Canada’s epic role in the war, which has largely remained unseen for many Canadians. The international ensemble cast stars Evelyne Brochu (Orphan Black, Pawn Sacrifice) as Aurora, a half Jewish- German, half French-Canadian, trilingual strategist and undercover specialist; Jack Laskey (Endeavour, Hatfields and McCoys) as Alfred, a gentle soul with synesthesia – a condition that cross-wires one sense with another, giving him near-perfect memory; Warren Brown (Luther, By Any Means) as Neil, an English ex-copper specializing in weapons and combat who lost his family in the Blitz; Dustin Milligan (No Clue, Extract) as Tom, a Madison Avenue advertising wunderkind, intimately familiar with the mechanics of persuasion, propaganda and seduction; and Connor Price (Being Human, Carrie) as Harry, the team’s radio operator, explosives specialist and gadgeteer. Rounding out the cast is, as mentioned, Hugh Dillon as Duncan Sinclair, who runs the secret training facility Camp X and Lara Jean Chorostecki as Sinclair’s right-hand woman, Krystina Breeland. CBC should be congratulated for pulling together a wonderful website that provides some great backstory on both the characters and on the real Camp X. On that page there`s a remarkable bit of detail about how the CBC itself played a vital role in this new world of espionage and foreign intrigue. And there`s a scene from tonight`s premiere episode. Viewers will be able to enter the secret world of X Company with a weekly Debriefing, which is an online interactive experience including new content tied to the week’s current episode, also available online. You will be able to examine classified agent dossiers, tour important locations, watch training videos, read additional documents, and more. 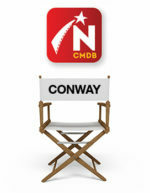 In addition, episodes will be available online in real-time as each broadcast of the series will become available on the CBC Player during the broadcast to Atlantic Canada.